“WHAT TIME IS IT! ?” If you never heard that phrase uttered before then you better strap yourself in for one hell of an adventure (time). Originally created by Pendleton Ward as a stand-alone short for Random! 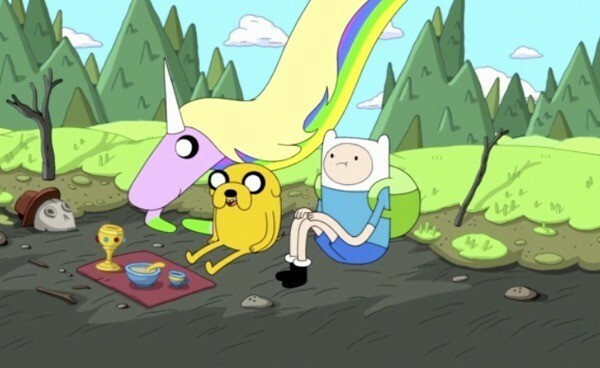 Cartoons on Nickelodeon, Adventure Time has grown into so much more, adored by fans both young and old. 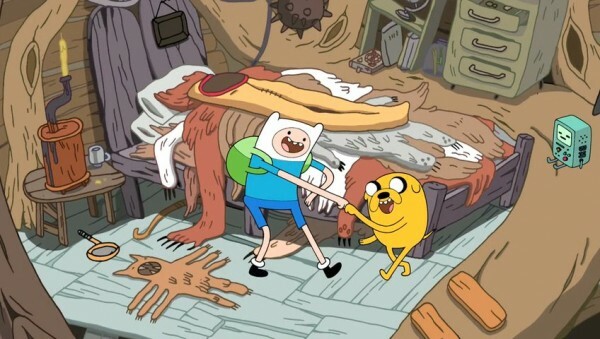 Seeing the short’s potential, Cartoon Network then picked up the show in 2008 thus sparking the surreal, bizarre adventures of Finn the human and Jake the Dog, that make up Adventure Time. If you’ve never seen Adventure Time before then now is the perfect opportunity to see it with the release of the full first season on DVD. On the surface Adventure Time seems like your average modern day cartoon, following the tales of two loveable heroes Finn, a 12-year old boy and his brother and roommate Jake, a 28-year old mischievous dog with magical stretchy powers, on their quest to become heroes in the magical Land of Ooo. 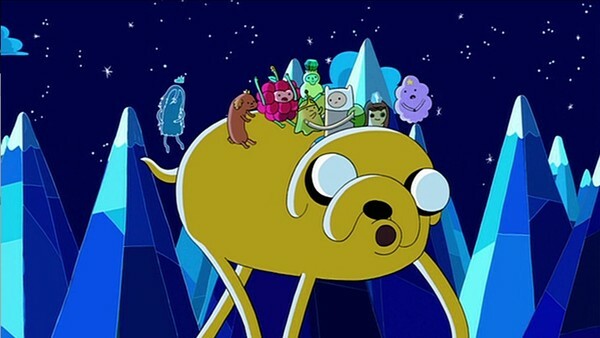 Much of the humor and appeal of Adventure Time comes from the outright bizarreness of the show. While the synopsis may seem quite simplistic, it would be wrong to write off Adventure Time’s overall story as so, because it’s hard to sum up exactly what Adventure Time is all about. Yes we are following Finn and Jake’s epic cartoony quest, yet on the other hand the story is a lot deeper than, that dealing with rather grown up and complex themes such as relationships, break ups, causality, and even existentialism in it’s own goofy way. No quite what you expect from a “kids show”. There’s little continuity between each episode, as they are all (mostly) self-contained, the main focus of the show is put on the characters themselves and their surreal adventures in the short 10 minutes episodes. Yes you read correctly, each episode of Adventure Time clocking in at around 10 minutes only. But that isn’t necessary a draw back but rather due to length of the episodes, the show is incredibly addictive to watch and leaves you wanting to watch another, and another and another. While there’s a typical set up to each episode, for example, Finn and Jake must help out a group of villages from an ogre (who’s kind of a jerk) or save various princesses from The Ice King, the episodes don’t progress as you typically expect. Rather expect the unexpected when watching Adventure time. 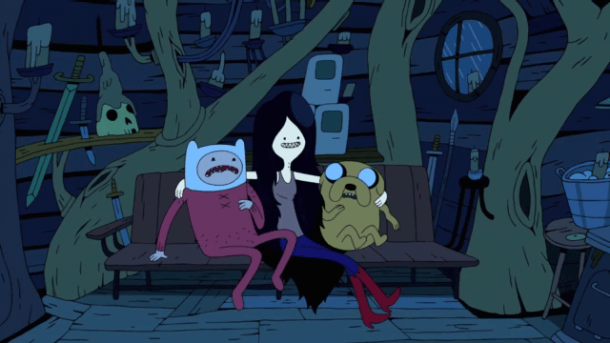 There’s almost always a surreal twist or some crazy outlandish thing that gets in the way of normality in each episode, and that’s part of the whole fun in watching Adventure time. You don’t know what’s going to happen next, whether it’s the sudden and unexpected, random episode endings or the memorable one-off characters we meet in an episode. Again because of the short length of the episodes, an episode’s climax and resolution usually occurs within the last few minutes. And likewise, each episode’s set-up only takes less then a few minutes to get into the action. Making for a no-filler approach to anime, a welcome relief for fans of Japanese anime who’s eyes glaze over the usual filler episodes. Adventure Time is wonderfully colorful and has a minimalistic yet very distinctive look. Its visuals are a joy to look at and are instantly recognizable as Adventure Time’s. If you look beyond the magical Land of Ooo and pay attention to the background, you’ll notice something off or just not quite right with Adventure Time. The creators have put a lot of subtle detail into the show’s setting the Land of Ooo, which may or may not have take place after an apocalyptic war, after effects of which filled the land with magic and created it to be what it is today. Subtle nodes to this premise are ever so present with in the show, but usually go unnoticed due to the story at hand. It’s the small things to look out for in Adventure Time that makes the show what it is, for example there’s a hidden waving snail in every episode of Adventure Time; and why? It’s a running gag. Music in the show is also of particular note. The theme song at first catches you off-guard with its off-key vocals and simple ukulele, though after a few episodes you’ll be wholeheartedly singing along with it. Occasionally the show will throw in the odd musical number, and much like the show itself they’re weird, wacky and you’ll love them regardless. As you would expect from a two-disc bundle, there are a range of extras to explore. Audio commentary for four episodes are included and for those that skip this feature or don’t usually listen to it, I must say it’s well worth it. Also included in the extras, is probably the weirdest behind-the-scenes video ever made. 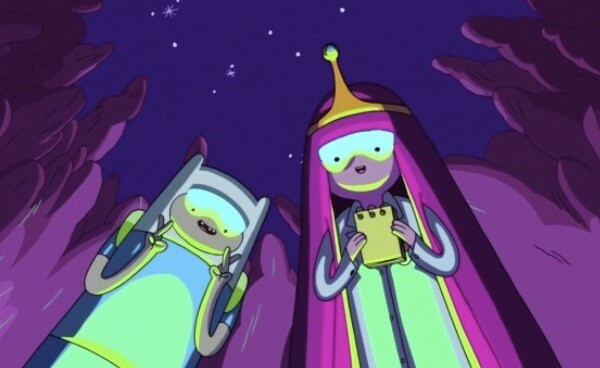 Filmed by Adventure Time creator Pendleton Ward on his phone, this 10-minute video takes us behind-the-scenes of the Adventure Time studios where, going by the video, explains a lot of the show’s weirdness. And guess what? Included on the extras is a making of that very extra. A making of the behind-the-scenes extra…yeah it’s weird man, featuring a guy in a full body motion capture suit. Trust me it will all make sense. Alongside these are some featurettes and storyboard animatic with voice over by the show’s creators. If you haven’t caught on by now, Adventure Time is not your average cartoon. It’s filled to the brim with wacky characters and offbeat humor, making it a complete joy to watch. The great strength of Adventure Time is that its episodes don’t have to be watched in order to fully understand the show, meaning that anyone can get into the show. Adventure Time is a show for kids both young and old with its unconventional storytelling and (there’s only one way of putting this) uniquely Adventure Time characters. 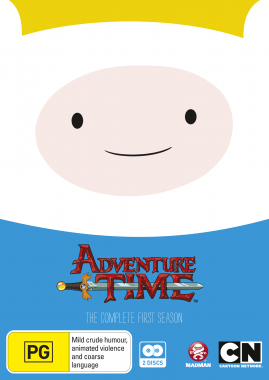 For fans of Adventure Time, which there are many, or new comers to the series Adventure Time: The Complete First Season is clear choice with all 26 episodes together for the first time with a ton of extras to boot.